BECC is a national Summit on Behavior, Energy & Climate Change, bringing together policymakers, researchers, and communicators to discuss how insights from social science research could help address our energy/climate challenges and to identify critical research and policy issues. 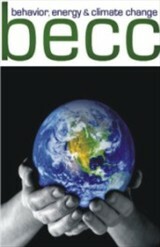 The heightened attention that BECC has brought to the role of behavior in energy and climate policy and programs has resulted in policy makers at every level -- from the Executive Office of the President and the Congress to local communities -- increasing the use of social science research in policy and programs. Full Set is available in mp3 format on a free USB stick, or on CDs (each session on separate CD, with tracks). Comes in free binders. Both are MAIL ORDER ONLY. This speaker was the only one on the panel who agreed to be recorded. Reduced Mp3 price as this recording is only 30 minutes long. Lunch Keynote: Col. Robert “Brutus” Charette, Jr.